Lawrence Shankland's header secured St Mirren a much-needed victory at rivals Greenock Morton. The Buddies had won just one of their last nine matches in all competitions and triumphed thanks to the on-loan striker's close-range effort. 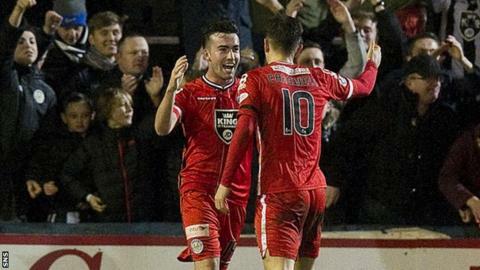 Thomas O'Ware and Michael Miller went close before St Mirren swiftly capitalised through the on-loan Aberdeen striker. Jack Baird went close to makihng it two late on. Match ends, Morton 0, St. Mirren 1. Second Half ends, Morton 0, St. Mirren 1. Attempt blocked. Denny Johnstone (Morton) right footed shot from the centre of the box is blocked. Corner, Morton. Conceded by Stuart Carswell. Attempt blocked. Ross Forbes (Morton) right footed shot from the centre of the box is blocked. Keith Watson (St. Mirren) is shown the yellow card for a bad foul. Mark Russell (Morton) wins a free kick on the right wing. Jack Baird (St. Mirren) hits the right post with a header from the centre of the box. Corner, St. Mirren. Conceded by Mark Russell. Attempt blocked. Calum Gallagher (St. Mirren) right footed shot from outside the box is blocked. Attempt missed. Thomas O'Ware (Morton) right footed shot from outside the box misses to the right. Attempt saved. Declan McManus (Morton) right footed shot from outside the box is saved in the bottom right corner. Corner, St. Mirren. Conceded by Conor Pepper. Corner, St. Mirren. Conceded by Lee Kilday. Alex Samuel (Morton) is shown the yellow card for a bad foul. Foul by Alex Samuel (Morton). Andy Webster (St. Mirren) wins a free kick on the right wing. Denny Johnstone (Morton) hits the right post with a right footed shot from the centre of the box. Substitution, St. Mirren. Calum Gallagher replaces Paul McMullan. Corner, Morton. Conceded by Sean Kelly. Attempt saved. Denny Johnstone (Morton) header from a difficult angle on the right is saved in the bottom right corner. Cameron Howieson (St. Mirren) wins a free kick in the defensive half. Attempt missed. Alex Samuel (Morton) right footed shot from the centre of the box misses to the right. Corner, Morton. Conceded by Keith Watson. Foul by Cameron Howieson (St. Mirren). Substitution, Morton. Alex Samuel replaces Michael Miller. Joe McKee (Morton) wins a free kick in the attacking half. Foul by Paul McMullan (St. Mirren). Attempt saved. Cameron Howieson (St. Mirren) left footed shot from the centre of the box is saved in the centre of the goal. Denny Johnstone (Morton) wins a free kick in the defensive half. Foul by Stuart Carswell (St. Mirren).